Delacorte Books for Young Readers, 9780553534023, 288pp. Welcome to LEGENDTOPIA, where fantasy meets reality in a new series from the author of JOSHUA DREAD! 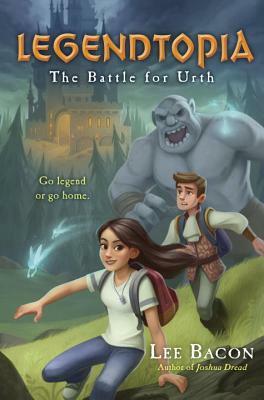 Two kids--Kara, a girl from our world, and Prince Fred, a royal boy from the kingdom of Heldstone--join forces to save Urth. Have you ever been on a school trip that went totally, epically wrong? That’s what happens when Kara visits Legendtopia, a fantasy-theme restaurant with her class. She’s just trying to retrieve her prized necklace when she stumbles through a small wooden door . . . and into a magical world where dragons breathe fire and an evil sorceress is out to get her! Luckily, Prince Fred is ready to be at Kara’s service. He’s desperate for someone in the kingdom of Heldstone to recognize his bravery—and he knows exactly how to handle ogres and elves. But he’s clueless when it comes to Urth, a mystical and thrilling place with cars and cell phones. That’s exactly where he ends up when he follows Kara back through the door. And he’s not the only one after Kara. . . .
Magic is spreading. A dark kingdom is rising. And the fate of not one, but two worlds rests in Kara’s and Fred’s hands. LEE BACON is the author of the Legendtopia and Joshua Dread series. He grew up in Texas. For two years he lived in Germany, where he encountered many castles and zero dragons. He now lives in New Jersey.